Find out something about Croatia and enjoy our flag printables - including jigsaw, bookmarks, colouring page and notebooking pages! The Republic of Croatia lies in the south of Central Europe. Slovenia is to the northwest with Hungary northeast and Balkan rival Serbia to the east. Croatia curves around Bosnia and Herzegovina to the southeast, with the southern tip reaching Montenegro. The most distinctive feature of Croatia’s geography is the Dalmatian coastline which runs along the Adriatic Sea for nearly 500 km, with a total coastline of 1,788 km. Croatia has 1,244 islands including Hvar, a Unesco World Heritage Site, where local lavender farms and vineyards benefit from the 300 days a year sunshine. 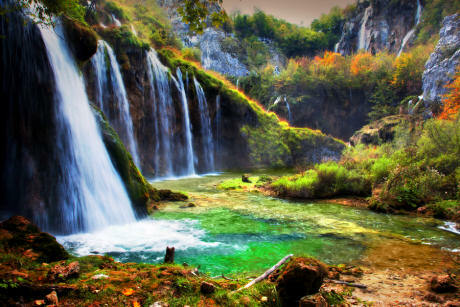 There are 8 national Parks including Plitvice Lakes which has 16 turquoise lakes and terraced waterfalls. No swimming is allowed to protect the pure water, which is used for drinking. Croat tribes arrived in the Balkan in the 7th century CE. Their origin is unclear as they may have been Persians or Slavs from Bavaria. The Croatian national emblem of a chequerboard may be based on ancient Persian pottery. Croatia lies at the crossroads of the Mediterranean, Central Europe and the Balkans territory. It has therefore been colonised, invaded or ruled by Greek, Roman, Ostragoths, Byzantine,Venetian, Hungarian, Hapsburg, French and Austro-Hungarian powers! Zagreb, the capital city, lies in central Croatia, so many visitors to the Dalmatian coast miss out. Formed in 1850 by the merger of two towns , Zagreb is famed for the hospitality of its people. Legend has it that Zagreb was spared by Ottoman invaders in the 14th century when they blew up a rooster with a canon which they took as a bad omen and so decided not to invade! Krapina Museum near Zagreb is world famous for its collection of Neanderthal fossils, 125,000 years old. Finds include 1,000 stone tools and wooly rhinoceros bones. Dubrovnik (Ragusa) is the most visited site in Croatia. Dubbed 'The Pearl of the Adriatic' by Lord Byron, Dubrovnik has a stunning walled Old Town with marble streets and Renaissance fountains. The Game of Thrones TV series was filmed as the location of King’s Landing. Split, Croatia’s second city, is most famous for Diocletian’s Palace. It was built for the retired Emperor in 295 CE near his birthplace of Salona. It was 215 metres long with walls 26 metres high and took 10 years to complete. It is so large the entire old town lies inside the walls. Croatians speak their own language and use the latin alphabet, unlike many other Balkan countries. Dalmatian dogs with their distinctive black spots and white coat originated in Croatia. In the17th century they were used as hunting and guard dogs. Ties were invented by Croat Hussars serving in the French army in the 17th century! The troops wore blue handkerchieves tied around their necks, which the French named Cravattes. Torpedoes, parachutes, and ballpoint pens were also Croat inventions.